MRI Brain FIESTA (3D CISS) sequence shows an intra canalicular nodular low signal intensity of a 8th CN Schwannoma confined to Internal Auditory Canal on left side. 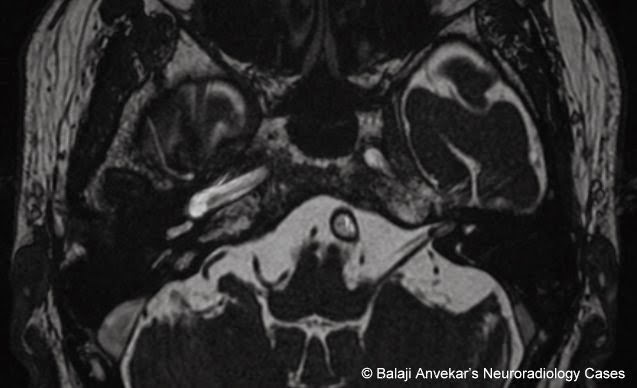 Acoustic schwannomas are a treatable cause of sensorineural hearing loss. Currently, MRI is the gold standard examination and screening test for exclusion of acoustic schwannoma particularly those confined to internal auditory canal. In MRI we have two main options in addition to the routine MRI sequences, one is Contrast Enhanced study and second is FIESTA (fast imaging employing steady-state acquisition) sequence. Contrast Enhanced study consist of plain T1 and Gadolinium-enhanced T1-weighted images, both in multiple planes, adds extra time and cost to the examination, and possibility of contrast reaction exists. Whereas FIESTA is a single sequence, a true-FISP (free induction steady-state precession) sequence that provides high-resolution fluid-bright images of the CPAs and basal cisterns. In a study of 50 patients, results of contrast enhanced study and FIESTA images were compared. The hypothesis was that the FIESTA sequence can replace contrast enhanced study for screening and diagnosis of AS confined to internal auditory canal. The results showed that in 98% of cases, this was possible. So the FIESTA sequence can be employed in isolation for screening of AS. Same can be equally beneficial in cases where gadolinium is contraindicated such as pregnancy. However, Contrast enhanced study should be employed when pathology is seen and to follow-up post-surgical patients. Conclusion: Use of the FIESTA (CISS) is sufficient to exclude AS confined to internal auditory canal without the need for gadolinium-enhanced sequences.